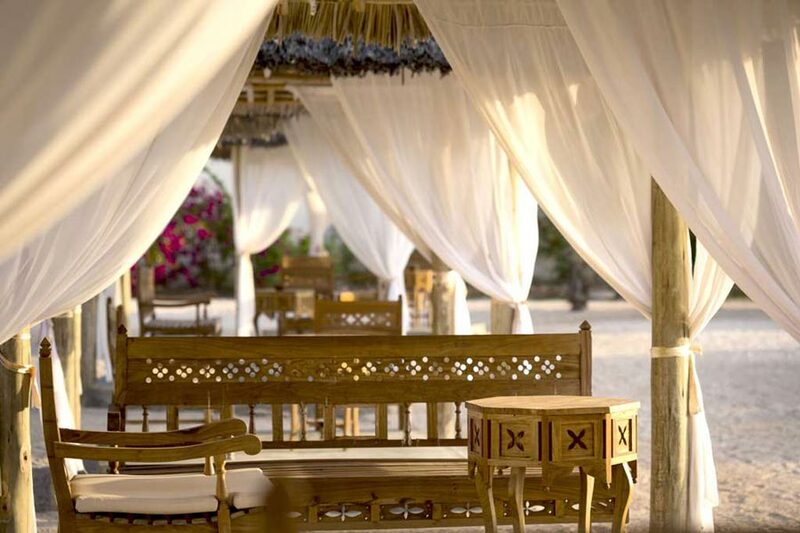 At Gold Zanzibar Beach House & Spa Hotel, indulge in 5-star service with a beach truly from paradise. 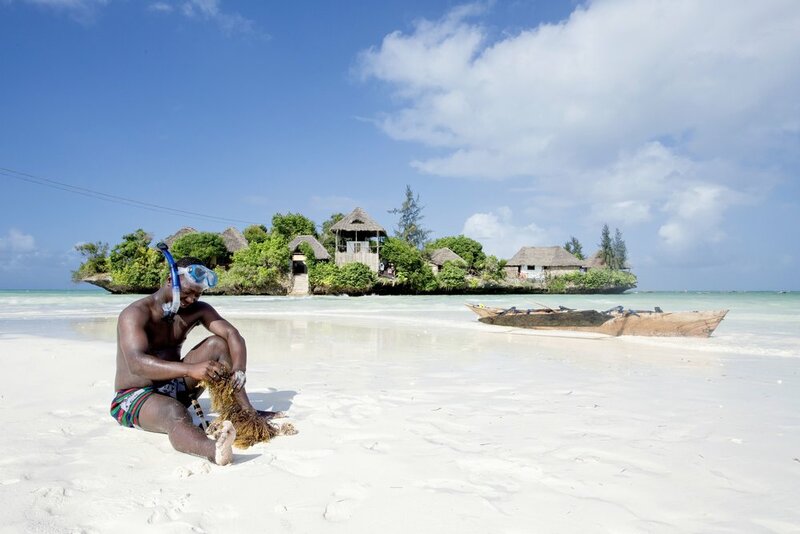 This stylish resort is located in the heavenly location of Kendwa, a secluded spot on the northwestern coast of Zanzibar that is not affected by tides or seaweed, just calm and clear waters all day. This perfect place is undoubtedly one of the world’s most desirable locations. White coral sand, beautiful turquoise water and warm weather all year round define the natural setting of this deluxe retreat, where guests can enjoy a relaxing holiday with all the comforts of an exclusive destination. 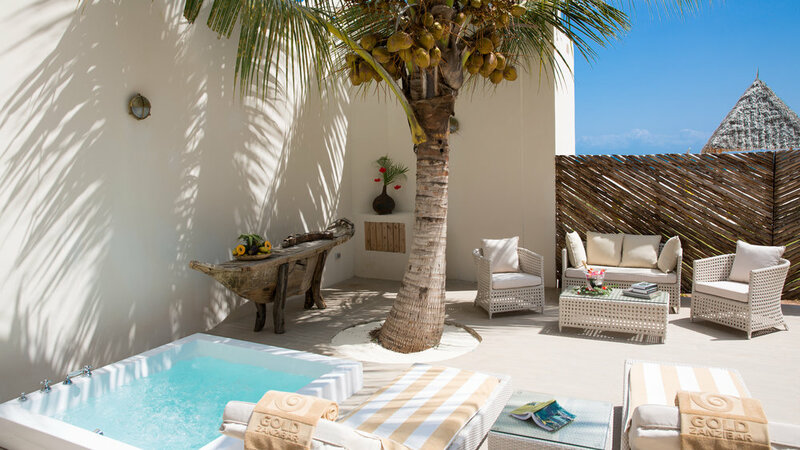 The elegant rooms, suites and villas all boast their own veranda, either ocean or garden view, with some offering direct access to the beach and even featuring a private outdoor gazebo. Two 5-star restaurants and bars serve a la carte menu and a buffet of abundant and delicious fresh food. 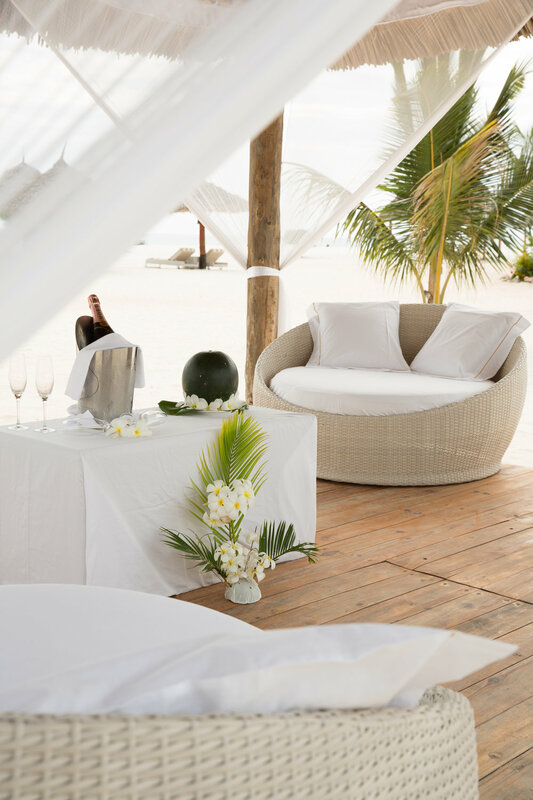 Private dining on the beach can be arranged for those special celebrations with a perfect backdrop of a tropical Zanzibar sunset. For real beach lovers, snacks or more substantial choices from the menu can be served directly under your parasol on the beach. The Deluxe Garden Rooms and Deluxe Ocean View Rooms (70 sqm) are located on the ground or first floor and overlook the gardens or towards the sea. Both room styles offer the possibility of intercommunication between two units. The Beach Suites and Beach Suites with Pavilion (90 sqm) combine the exclusivity of a prime location with easy access to the pool and the beach. An opulent touch is the private gazebo, the perfect place to read, to relax, to enjoy a sumptuous breakfast or a romantic candlelight dinner. The Luxury Villa Retreats (200 sqm) offer three styles of villa, each interior influenced by African, Arabian and Italian style respectively, offering all the superior comfort of contemporary design. Each retreat features a large living-room with a bathroom and ‘sale de bains’; a master bedroom and another with a double bed as well as an en-suite. The exterior offers a wide veranda with jacuzzi and a privy tent. A room with an ocean view at Gold Zanzibar Beach House & Spa is an idyllic place to enjoy the experience of a truly luxurious holiday on this island of paradise. 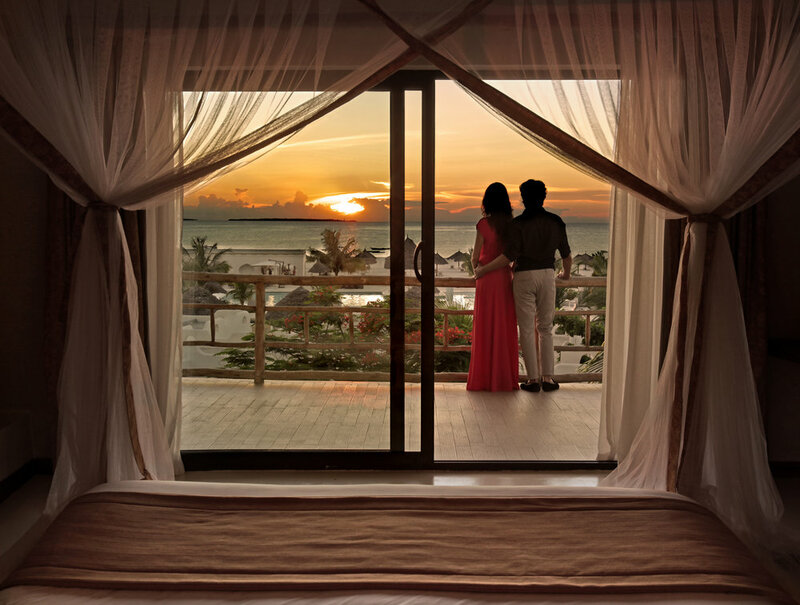 A Deluxe Ocean View Room has a surface area of 70 sqm and a private veranda. Located on the first or ground floor, it offers a fabulous view, whether you choose a Single, Double or Twin room. 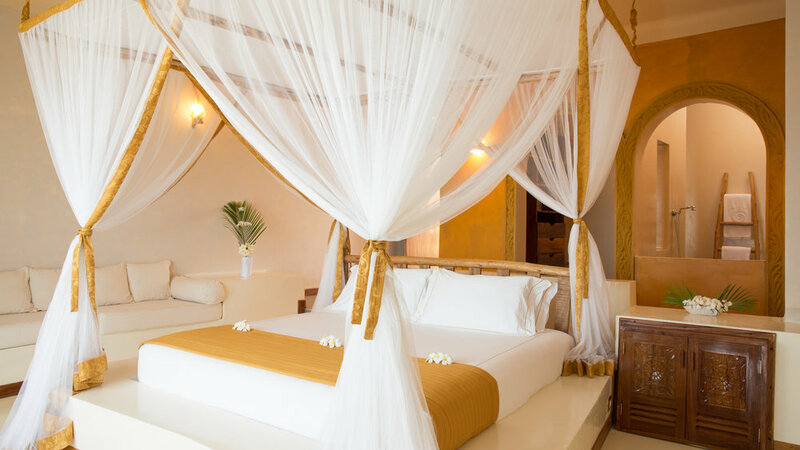 Each room comes with elegant furnishings and textiles of white and golden shades, which reflect the contemporary, yet natural style of the resort bordering the ocean. The room is particularly defined by that special light you can only find at the tropical latitudes of the Indian Ocean. Featuring wide spaces, the room offers a bedroom with wardrobe, a fully-equipped bathroom, a sitting area and an outdoor patio where you can relax while surrounded by fabulous scenery. The luxury Deluxe Garden Rooms at Gold Zanzibar Beach House & Spa come with a splendid view of the resort’s tropical gardens. Located on the ground floor, they are extremely spacious, with an area of 70 sqm and a veranda, whether Single, Double or Twin. The luxury rooms overlooking the garden can also be interconnected with another unit to form an ideal home for families or groups of friends. This type of accommodation features ample spaces, a bright environment and contemporary design, which will ensure you have a relaxing and enjoyable stay. The delicate white and golden shades of the decor diffuse a special light, while the wooden carved elements add an exotic touch to create a cosy ambience with a luxurious feel. There are seven exclusive Beach Suites to satisfy the most demanding wishes. The Beach Suites are especially created for those guests who wish to take full advantage of the resort’s spectacular beach. Just a few steps from virgin sand, in a privileged spot with easy access to the pool, the suites feature elegant interiors and wide rooms covering an area of 90 sqm, with a master bedroom, a lounge with two comfortable sofas, a fully-equipped bathroom and a veranda with table and chairs. 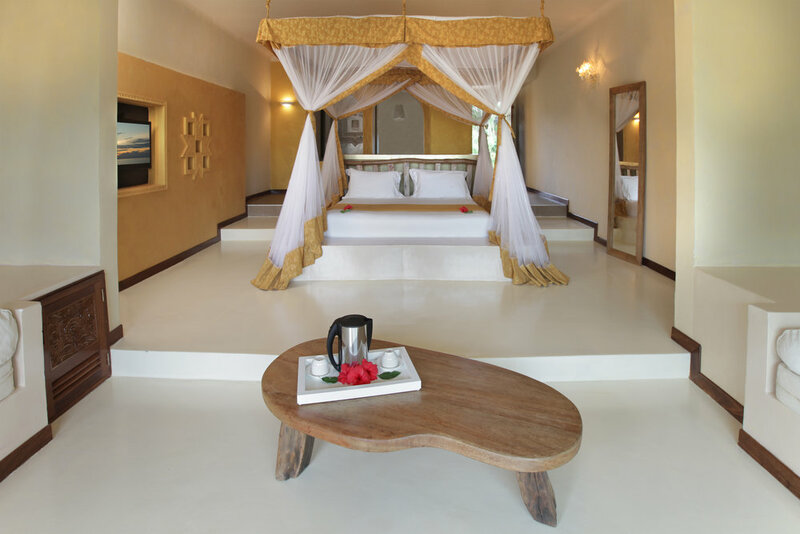 Each suite is your ideal home in Zanzibar, if you have an eye for style and a feel for extra comfort. Ample spaces, delicate white and golden tones and diffused natural light convey an incredible sense of peace and harmony. The carved wooden furniture adds an exotic touch and local flavour. The new luxury suites in Zanzibar named Beach Suites with Pavilion are the latest addition to the Gold Zanzibar Beach House & Spa Resort. Only five of these luxury units are available. They combine the exclusivity and comfort of easy access to the pool and are only a few steps from the beach with an opulent private gazebo; an oasis of peace to enjoy the luxury of absolute privacy. The suites are elegantly designed to create a relaxing environment of pure luxury. Golden and white tones, exotic elements and contemporary furniture mix with modern style in these sumptuous suites in Zanzibar. All of them feature ample rooms with a master bedroom with a double bed, a sitting area with two sofas, a bathroom and a luxury open-air tent. Among the luxury beach villas of the Gold Zanzibar Beach House & Spa, the Italian Villa stands out for that certain elegance and charm that reminds one of Italy. This exclusive retreat, designed to pamper body and soul, features a most extraordinary jacuzzi set on the outdoor veranda, a true oasis of peace and well-being nestled in a luxurious environment. The Italian Luxury Villa sets itself apart from the other available luxury beach villas with its modern designer furniture and an exquisite combination of white and golden shades that radiate harmony and peace. Like the other luxury villas, it covers a surface of 200 sqm and features two spacious bedrooms, two bathrooms, a lounge, the patio and an additional private tent on the beach. A Zanzibar beach villa of exotic taste, the African Luxury Villa is a perfect example of luxurious accommodation in harmony with its surroundings. Like the other two villas, this is a real oasis of tranquillity. It features an amazing jacuzzi embedded in its private veranda set directly on the beach. Uniquely decorated with an eclectic mix of contemporary furniture pieces inspired by the traditional culture of Zanzibar, this beach villa of 200 sqm comes with two spacious bedrooms, two bathrooms, a sitting area, the patio and an additional beach tent to enjoy the peace of Zanzibar. The Arabian Villa is a unique charming retreat with a large jacuzzi embedded in the corner of your private veranda. Decorated with elements of Arabic influence, this is one of the three large luxury villas individually designed to welcome guests to enjoy the very best of this beautiful exotic island. Like the other two villas, it covers 200 sqm and it includes two spacious bedrooms with a large wardrobe, two bathrooms, a comfortable sitting area, a large patio and an additional open-air pavilion to relax in the privacy of your own den. The Kilimanjaro Restaurant at Gold Zanzibar has plenty to offer. This restaurant is the hotel’s main dining room. At dinner, there is the opportunity to sample both international and local Zanzibar dishes creatively prepared a cosmopolitan team of professional chefs. In the morning, The Kilimanjaro Restaurant provides the best start to the day with its abundant breakfast buffet. The Gold Restaurant on the beach of Zanzibar is perfect for celebrating unforgettable moments on this incredible tropical island. The stylish Gold Restaurant is a charming lunch and dinner venue, defined by an elegant and private atmosphere. It is an exclusive restaurant, only accessible upon reservation, where there is a tantalising gourmet selection served a la carte. The Gold Zanzibar Beach House & Spa is an oasis of peace and harmony, the ideal place to relax and rejuvenate surrounded by the natural beauty of this tropical island. Be pampered by the expert hands of dedicated therapists who help regain balance and revitalise mind and body. 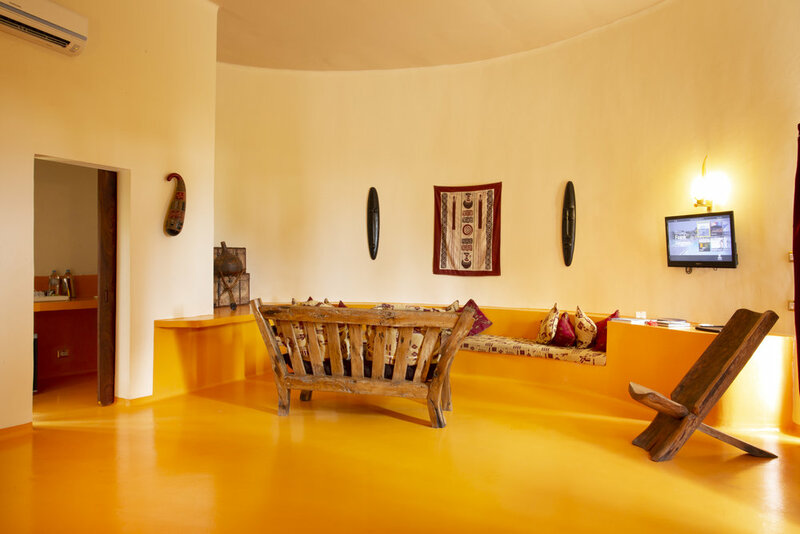 All treatments are provided by Healing Earth, a premium organic spa brand inspired by Africa’s ancient energy and in harmony with the holistic approach of our wellness resort. For real wellness holidays, there is the fitness corner with the latest Technogym equipment and a personal trainer. The Sultan Bar is an elegant venue to mix and mingle with other international guests, to relax in good company or listen to live music while tasting pre and after dinner cocktails. Try one of the classics such as a Martini or a fancy frozen cocktail included in their great selection of specialty cocktails. Bubbles are never amiss. Every night at our luxury hotel you can choose among the best names like Moet & Chandon, Dom Perignon and Taittinger as well as excellent Chilean and Italian sparkling wines.